Last year we ran a survey of Stitchmastery users and one response particularly caught our imagination – someone told us they would like to hear from other Stitchmastery users and how they make use of the software. We’re delighted to bring you a series of interviews with designers, tech editors, magazine editors and teachers – we hope you enjoy reading them! 1) When did you start designing? Could you give us a potted history of your knitty and designing background? I learned to knit as a young child in school, probably at the age of 6 or 7. I don’t really remember learning, it feels like I’ve always knit! My mother was able to knit but found it too slow and preferred crochet and sewing. My grandmother on the other hand was an obsessive knitter and took great pride in her work. I knit until 12 or 13 both for myself and my very lucky doll collection but by the time I reached my teens I had stopped. It wasn’t until my fourth son was born that I returned to it. At that time I had sold a business and was intending on becoming a full-time mother. After a few months even though I was exhausted, I wanted a little brain stimulation and returned to knitting. Within a few months I was designing and a year later I had my first pattern published. When I left school I couldn’t decide between art and maths/science. Initially I spent a year in art college but then missed numbers too much so went back to do structural engineering! Neither side was really right for me and it really wasn’t until I started designing that I found my place. 2) Do you have any recurring sources of inspiration or unusual muses? Not really! Usually when I design it’s something I want to wear. A shape, colour or item of clothing I’d love for myself. I try to combine that with interesting knitting and construction techniques that will keep knitters interested the whole way through the project. 3) When you have an idea, do you always work to a set workflow (eg swatch-knit-chart / chart first then knit) or does your approach change with each design? I’ve got both an ‘ideal’ workflow and the fly by the seat of my pants method. In my ideal world my process is as follows; swatch all stitches used in the design, drawing up on Stitchmastery as I work, work out the gauge, write each sizing out in Excel, write a bare bones pattern and then knit from that pattern. This allows me to edit the written pattern as I go and become my first tester. Now sometimes I am travelling, need an immediate project and it becomes; swatch, sketch, write as I knit and then put the pattern on the computer as soon as I have access and time. The faster I get it into the computer the more accurate my patterns tend to be! 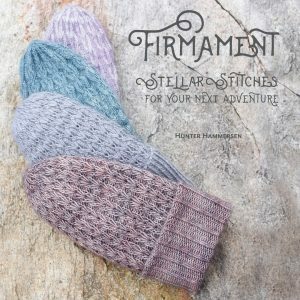 4) What made you choose to use Stitchmastery? Is there a particular feature you use most regularly or couldn’t do without? And is there anything you wish Stitchmastery could do? Before Stitchmastery I had bought and tried pretty much every chart software on the market. Some were easy to use but their output was very low resolution and then other ones ended up have a very steep learning curve to do more complex tasks. Stitchmastery was impressive right out of the box; it’s was very easy to use, just drag and drop symbols and I was able to learn most of it intuitively. Pretty much the only feature that I really needed was added in the version 3 update, the ability to export as an EPS file. This means that when we do our pattern and book layouts using InDesign I no longer need to import the file into illustrator and export as an EPS so it removes one step from the process. I do wish I had more time to learn how to do my own custom template with descriptions etc. set up the way I want them to look. Right now I just go and edit the key every time which is probably not the most time efficient way of doing it! 5) Please tell us about your latest publication or next exciting project! 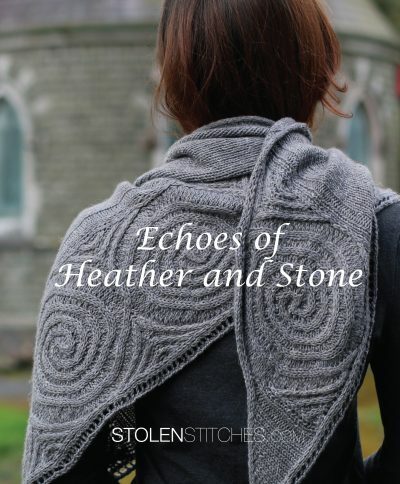 We are just now [at time of writing] putting the finishing touches to our new book, Echoes of Heather and Stone. This is the first collaborative project that I’ve done and I’m really excited about it! It’s such a privilege to have talented designers working on a project with me. 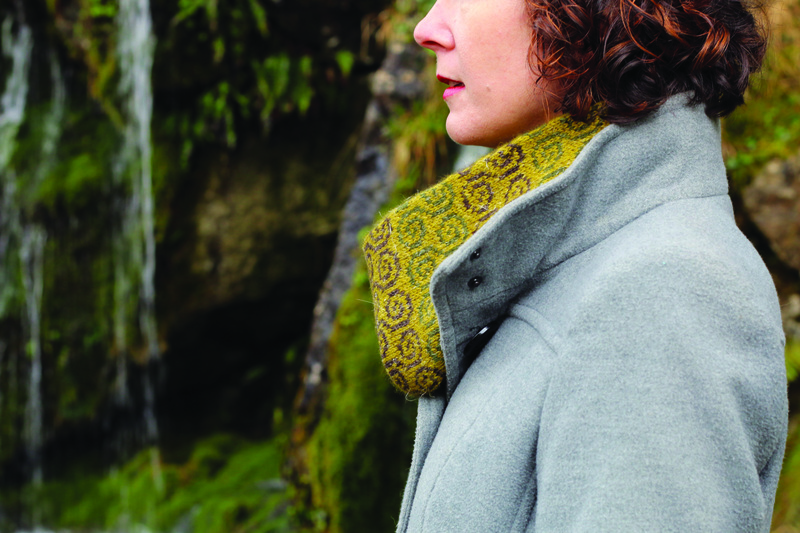 The book will take it’s inspiration from Ancient Ireland and all projects are knit using my Nua yarn. Stitchmastery is used to it’s full potential in the book with many, many pages of charts included! Photo of Epona from Echoes of Heather and Stone.